Old letters offer a glimpse into a person's past. They tell stories of a family's great personal triumphs and tragedies and speak of the mundane aspects of everyday life as it was lived in another era. Because these items are truly one of a kind, they deserve to be displayed in a way that highlights as well as protects them. Several options exist that will accomplish these goals, each providing a relatively simple way to bring a little bit of the past into the present. Preserve your old letters by making them into a decorative display. Purchase shadowbox kits. You can find these at local arts and craft stores as well as stationery stores. They range in size and design. It may help to shop around a little bit while keeping in mind the letters you want to display. Try using architect's tape on the letters and pictures if you need to tape them to the shadowboxes. Used by architects to tape blueprints, it will stick to the paper without tearing it. You can find architect's tape in art supply stores. Gather the elements for the shadowboxes. These items will include the old letters, but can also be old photographs of the people spoken about in the letters, special jewelry, coins, medals and other items of personal importance to the letters' subjects. Assemble the shadowboxes. Layer the elements in the shadowboxes so that the most important parts of the letters are revealed. Add in the photos and other decorative elements. 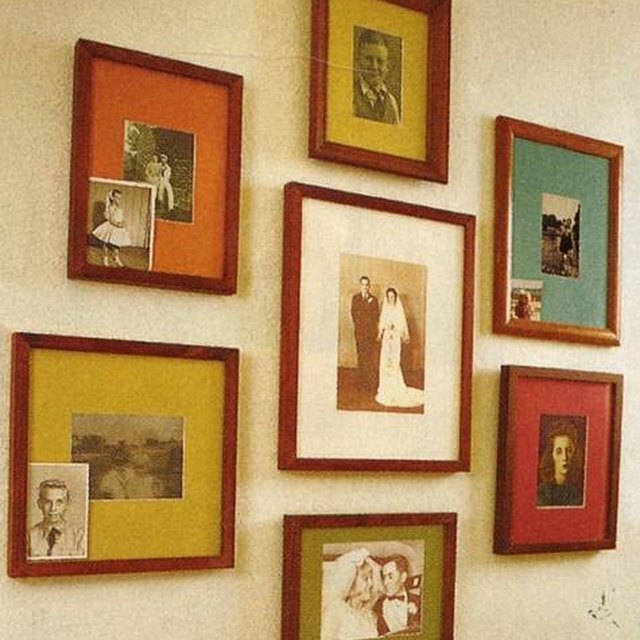 Hang the shadowboxes in a wall display you create specifically for them. Collect some visually interesting old jars like canning Jars or wide-mouth bottles. This type of backdrop for the letters provides a "message in a bottle" feeling for the old letters. Make sure they're large enough to show off at least some of what's written on the letters; jars that are too skinny will make most of the message inside disappear. Look for different sizes of jars and bottles. Insert the letters into the jars and bottles. Turn the letters so the portions you find most interesting face outward and can be read. Place the jars on a shelf or mantel, making sure that they're up high enough to read. Cut a piece of glass or Plexiglas so that it fits the top of your coffee table exactly. You can have this done at a local glass shop if you bring them the measurements of your table. Arrange the letters on the coffee table. Cluster the letters according to the year they were written, the information they talked about, or by author. Lay the glass top on top of the letters, taking care not to mess up your arrangement; the air displacement caused by the glass being lowered can disrupt your display. Work slowly to prevent this. What Materials Are Best for Reflecting? What Can You Use Besides Cinder Block for Shelves?